Sometimes poetic nostalgia for an idyllic “traditional family” past just masks a stubborn refusal to accept reality, says Role/Reboot’s Editor-in-Chief Nicole Rodgers. Conservative men love to summon righteous indignation anytime it’s brought to their attention that the real world does not resemble an episode of Leave It To Beaver. So strong reactions to Wednesday’s Pew report that a record 40% of all homes with children now include mothers who are either the sole or primary source of income for the family should come as no surprise. The now infamous all-male Fox News panel reacted with a charming combination of biological essentialism (said Erik Erickson: “When you look at the natural world, the roles of a male and a female in society and in other animals, the male typically is the dominant role…we have lost the ability to have complimentary relationships in nuclear families”), and apocalyptic tantrum throwing (“We are watching society dissolve around us!” warned Lou Dobbs). A collective virtual sigh rippled across the Internet. The panelists’ hysterics made it easy to miss their central point though: that female breadwinners undermine the social order by leaving fewer women dependent on men. It’s this beautiful symbiotic marriage of male breadwinning and female economic dependency that, according to their diagnosis, keeps society from dissolving. Of course, if you buy this argument, and you want to assign blame, there’s plenty to go around. After all, there’s really no cultural institution that has undergone more dramatic change in recent times than the institution of marriage and family life. And with good cause: Educational attainment has been shifting dramatically in women’s favor for over a decade and in the biggest cities in the U.S., unmarried, childless women under 30 are earning higher salaries than their male peer group. Meanwhile marriage is no longer a precondition for children—in fact, among Millennials, more births happen outside of marriage than in it. Only 51% of adults were married in 2011 and nearly 4 in 10 say that marriage is becoming obsolete. Even within marriages, things have changed profoundly as it relates to the breakdown of roles that have traditionally been aligned along gender lines. It’s a brave new world, and not all positive. The Pew study does, in fact, expose a problem. It’s just not the one some think it is. It’s certainly not that some wives are making more money than their husbands (that’s actually what progress toward gender equality looks like). And although it’s genuinely troubling that the growing numbers of single mothers in our country are so likely to live in poverty, single moms are not the problem either. The problem is that a large portion of our society is still clinging to the existence (or hope for resurgence) of the mythic “traditional family,” marked by heterosexual parents in a lifelong marriage, with a primary breadwinner husband and primary caregiver wife, despite all evidence that this model is on life support. Of course there are serious challenges resulting from many of these newer trends, the most significant being the high poverty rates of never-married single mothers. But this should not, and cannot, simply be an indictment of all unmarried mothers—women already stigmatized and treated like social pariah, despite being a quarter of our families. We have to hold ourselves responsible for having an out-of-date policy landscape that barely supports or addresses their fundamental needs. Because it doesn’t really matter whether you think the changing face of the American family portends the end of times or is simply the next phase in our social evolution. It’s downright immoral to respond to the lives led by 40% of women in this country with disdain and judgment when what’s needed is support. And, if like the Fox panel, your only advice to fix what apparently ails us is to regress to a more gender-divided, natural order of things (patriarchy! male dominance! ), you are not promoting family values anyway; you are selling snake oil. We are not going back. 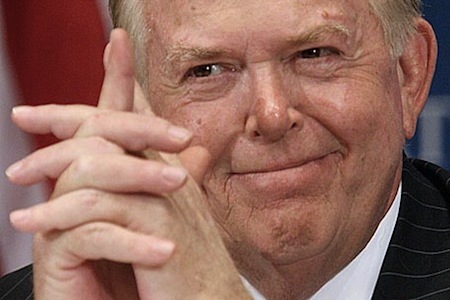 I ask this sincerely: What would Lou Dobbs and his friends like to do about the 40% of women in the Pew study that concern them so gravely? How exactly would he like to address this situation? (Does he plan to moonlight as the world’s most prolific matchmaker for single mothers? Will he give raises to underachieving husbands and pay cuts to their uppity wives?) I understand that the transformation from the “traditional family” unit to something that looks different may be genuinely upsetting to some folks, but pathologizing huge swaths of the country that are fast becoming the norm, not the anomaly, is also willful ignorance. Sometimes poetic nostalgia for an idyllic (though largely imagined) “traditional family” past just masks a stubborn refusal to accept reality. Change can be scary. But it’s our generation’s call to bring genuine respect and a sense of integrity to help make families of all types strong. This requires weaving a new social fabric that represents and recognizes who we really are and what we really need. What stands in the way now is old beliefs and moral outrage that judge lives today as morally bankrupt and inferior to a mythical past. These beliefs are widespread, often unconscious and rarely expressed quite as candidly as on Fox this week. But our future still can be a society where men and women (and men and men, and women and women) are true partners; where people commit to each other out of love, not necessity; where families of all permutations are seen as valuable; and where supporting and nurturing children is the focus of our policies. But we need to start with an acceptance of where we are before we can move to where we want to be.